This work began as a piece written for Michael Friend’s MIAS200 Seminar on Moving Image History, Philosophy and Practice. It has since been worked on and edited in several different forms, submitted to the Velvet Light Trap, the Moving Image and other journals. It has began a larger project that I plan on continuing past my graduate work which is to catalog and document the lived experiences of women in the moving image archiving community. Current plans include a website and filmed documents as well as audio work. This project, much like what we do in the preservation community itself, is to assure that certain communities (in this case, highly skilled female archiving professionals) do not get lost to the ravages of time/forgotten. The history and role of women within the moving image archive has been critical to its development. As essential as their physical presence has been, their absence has become increasingly noticeable within scholarly works and academic publications on archiving history. Using a combination of theory, historiography and ethnographic research, this piece seeks to investigate the reasons for this and substantiate some of the more gender-related issues having to do with being a female archivist employed in a specific realm that bridges art and technology. While women in the moving image archiving world may gravitate to more non-technologically-based-arenas, this is not always the case. Engaging contemporary personal testimonials with historical data reveals the moving image archive community to have a multiplicity of layers, including locations of triumph for women as well as a very tense conflict in relationship to gender and technology. In the careful disclosure of what would seem to be a subgroup but is truly a dynamic community, there is the possibility of preserving and restoring a marginalized group to a more secured location, without the worry that we are losing out on history by simply moving forward in current academic patterns. In her introduction to the Symposium on the Methodology of Film History in 1974, Eileen Bowser states that film archivists have the most important occupation but it comes heavily laden with accountability. “We have the riches of film history under our hands,”she notes, “ and it is a part of our responsibility to make them known, and to find the means for film historians to explore them.”(Bowser 1974-1975) While In this instance, Bowser was specifically arguing for access to and preservation of film, she may well have been making a case for the female moving image archivist community. In the study of archivists, more often than not, the names that pop out and garner the most attention are those of men. While there are women who have secured positions of fame and repute in the larger schema of the archival world, the fact remains that neither the names of those women nor their immense contributions to the community have been recognized in the way that they ought to have been. To an extent, this has set a pattern where generations of extraordinarily talented individuals have gone on to incredible careers in the field, without much historical documentation and very little recognition. While it remains a hard fact that the larger archival movement is built to take in and care for historical artifacts and restore and preserve them while at the same time generating scholarly interest and providing access, one must wonder at some point: who is archiving the archivists? In doing this brief historic and ethnographic review, I found intense challenges as well as fascinating results. The information that is written on a scholarly-level about women in the field of archiving is meager and almost non-existent. In the beginning, I was able to aggregate a fair amount of historical data on the initial representatives, like Iris Barry and Eileen Bowser, but then, I wondered, what about more recent examples? So I worked like an amateur archeologist, piecing together what I could from a combination of in-depth personal interviews, limited academic publications in existence, and professional websites/publicity. For my structural focus, I tried to follow the guidelines of archival ethnography as set forth by Karen F. Gracy. She defines this as a method in which the researcher is positioned “within an archival environment to gain the cultural perspective of those responsible for the creation, collection, care and use of records.” (Gracy 2007) While I was unable to position myself directly within the physical archives, the amount of personal data I received was significant enough to help locate me and help me achieve that all-too-crucial cultural perspective. What struck me as strange in this scenario was that women are not an absence within the archival body at large. In fact, female moving image archivists in particular are an extremely strong and dynamic force within the archival world. Their expertise within the information science and technological world bridges many gaps that documental archivists or other kinds of archivists simply don’t have. Many of these women were borne out of librarianship but moved towards the visual/moving image preservation world, and ended up making a career out of it. One of the first things I noticed upon my introduction to moving image archiving was the high number of active women in the field. Thus, as my research moved forward, I began to have more and more questions. Why was it that my interviewees kept mentioning women who had influenced them and yet I could find out nothing about them? Why was it that these names that I kept hearing over and over again were nowhere to be found in any scholarly literature on any search engine or within any books? The moving image archive space is global (look at organizations like the International Federation of Film Archives/FIAF and the Association of Moving Image Archivists/AMIA) and regional, profit and non-profit, and it runs the gamut of specializations from librarianship and cataloging to curatorship and exhibition, but it is still a community. However, it is a community that, in many ways, works within the confines of institutional hierarchy. While this is a necessary evil in order to achieve many larger archival goals such as standards, agreed codes of access, and items of that nature, institutionalism has bled through to the ways that we handle our own personal histories. The community may be aware of each other’s triumphs and successes on an intrapersonal level, but the rest of the world isn’t. It’s as though it were an interoffice memo being circulated around the moving image archivists’ community: everyone knows how many talented and fabulous women are there working today, but outside the office? No one’s gotten the memo. The larger, over-arching bodies that control our smaller communities and how we work seem to have also standardized and homogenized our history. In addition, we, ourselves, play a part in “letting” the institutions and their structural dominance hold sway over our own colleagues and the historical negligence of our field. The same institutionalism that forces many archivists into an almost monastic existence also makes them extremely goal-oriented and focused. Tight budgets, revenue generation and preservation issues are just three factors that go into creating an archivist’s tunnel vision; a condition which would cause her/him to relinquish concern about the historical data or academic scholarship about her/his profession. Why worry about the preservation of the personal archivist histories when the artifacts themselves need preservation? Valid as this argument may seem, the problem is that there is a metahistory that is going unwritten. Women have not only been a large part of archiving in general, they have been a huge part of the establishment of moving image archiving. The institution is helping to perpetuate the invisibility of women in the moving image archive world through its very make-up. They become part of the larger whole and swallowed up by the machinations of the institution, their personal histories left as an ellipsis. As I requested interviews with people, they would recommend that I interview still others. I discovered the female moving image archiving community to be even larger than I had imagined, and entirely undocumented. But there is a singular problem within this community: due to the nature of a group that is as hard-working, under-staffed, under-paid and overwhelmed as this one is, it is very difficult to take the time out to truly do a study on the history of “how we got where we did.” It was significant to note that many people regularly communicated with one other in three main ways: through the conference circuit, the archive circuit or the academic publishing circuit. However tricky it was to locate information on women in archiving, it was not at all difficult to see what a robust group it actually is. From the research I did, it became fairly clear that the development of relationships and formation of bonds was based upon a strong work ethic, a heady dedication to preservation and historical restoration, and, in many cases, a keen interest in the pursuit of moving image information technologies. There were many similar stories that came up, quite a few of the same names mentioned, and a great deal of the same situations, locations and/or conference scenarios. While every woman I spoke to was from a different part of the United States and had been in the moving image archive field for a different quantity of time and doing a very different job, the connections that sprang forth were astonishing. What might have once seemed to be a subgroup was now a community all unto itself, whether it was self-aware or not. The ultimate thing that arose, however, was that the ways in which communications had been traveling amongst this archival community (conference, archive-to-archive, some publication) was analogous to the oral tradition: stories that are passed down, over and over but never written down due to the circumstances of the time. Up until this juncture, no one has accessed this archival community or its “oral tradition” where much of its history is kept. However, as history has shown us, the oral tradition changed and became the written tradition and that is where we stand today. If we do not begin to write down these women’s stories, we will lose a valuable piece of history, for moving image archiving and for feminism. When film preservation began, there was no training. There was no Moving Image Archive Studies. There were no film schools, no certification programs, no way to show a person how to take a piece of historical heritage that was also (at the time) still considered a new art, and save it from certain death either at the hands of the studios needing the silver or simply by what they thought to be nitrate disintegration. Enter Iris Sylvia Barry, former film critic for British newspapers The Spectator and The Daily Mail in addition to her regular column for Vogue magazine. Joining the Museum of Modern Art (MoMA) in New York as a librarian in 1932, she was instrumental in their choice to form a Film Library in 1935, where she became curator. Up until this point, there had been no real attempts at film preservation work. Barry changed that. Barry’s attention to film preservation, access/circulation and exhibition brought something new to the film world and helped to legitimize it when it was badly in need of legitimizing. By taking film and analogizing its preservation and exhibition tactics to “normative” art objects such as paintings or sculpture, this helped ensure that people like Rockefeller would give foundational grants and people such as Mary Pickford and Harold Lloyd would donate their personal film collections. Iris Barry’s preservation imperatives and her position of power in the moving image archive community cut a remarkably strong female archival shape on a global scale. Not only did was she the foundational figure at MoMA, but she was also present at the first International Federation of Film Archives (FIAF) meeting in 1938. This presence translated to her being elected founding president of FIAF in 1946 and having a successful career within the international sphere, even after she had left the United States. Barry’s fearlessness and power were matched only by her commitment to the cause of film work. Her job at MoMA continued even after she retired, as she attended the FIAF meetings as their European surrogate. Because she was the first, she is also the most well-known, her methods helping set up the way for many other women. Eileen Bowser was the next woman to take MoMA by storm in tandem with Margareta Akermark. Both women held extremely high positions during the latter half of the 20th Century, a time when film was establishing itself as an area not only worthy of study but also as an art form that deserved preservation. These women are extraordinary in a variety of different ways, but more than anything they are notable for the fact that they ushered in so many different aspects of the world of cinema scholarship and technology. The earlier labor that Iris Barry had done was integral to the work that Akermark and Bowser continued due to the filmic boom in the outside world. With film schools and classes coming into existence where there once had been none and the greater proliferation of filmmakers wanting and needing to look at prints, things like Akermark’s “Wednesdays-at-noon” series were seminal. This weekly showcase was a place that primarily focused on shorts and animation while also giving local and independent filmmakers a chance to show their work. In doing so, MoMA was able to participate in that aspect of NY film art culture. As Akermark stated in 1968, “”Ever since the Wednesday Showings began two years ago, the number of filmmakers who are beating a path to the Museum’s Film Department is constantly increasing…They are anxious to participate in the series because the Museum affords them a showcase. Some of them have never before seen a film of theirs on a large screen.” (Museum of Modern Art 1968) Akermark’s enthusiasm for the participation of the local filmmaking community showed a refined interest in new art involvements as well as a discernible skill for the kind of collective creativity that has shown itself to be an integral part of many archives and archival structures throughout the country. While Akermark was the executive secretary for administrative affairs, making her own contributions to the archiving community and serving the Film Library (renamed the Department of Film in 1966) in whatever ways she could, the woman who put MoMA on the map during this time was Eileen Bowser. As one archivist has noted, “Iris Barry is acknowledged as starting the Film Department at MOMA, but Eileen Bowser brought the archive into the modern era.” (Tadic 2011) Bowser, who was initially hired by Richard Griffiths as a secretary, mirrored Barry in that she had no technical film preservationist training. This initial secretarial position, however, led to a life-long career that included serving on the executive committee of FIAF, being a well-known and respected writer in the film archiving profession and, most importantly, being one of the foremost authorities of the film archive at MoMA from the time she became associate curator in 1966 until she retired in the ‘80’s. While Eileen Bowser should be recognized and lauded in a multitude of ways, she revolutionized four major things at MoMA that had reverberations throughout the entirety of film preservation to this day: the necessity to catalog and know your archive, the formation of strong and dynamic relationships with scholars/academics, the attentiveness to “orphan films” and her inadvertent creation of Domitor, a silent film organization that is critical to film history. Each of these things individually would have been enough but together? She was unstoppable. Her love for the archive and desire to preserve film was so absolute that it took precedence over many other things and yet that did not disrupt her ability to correspond with the rest of the community. Her belief in teamwork for the larger view of film preservation and archiving on a level that goes beyond the subjective was also what made her work so intensely important. Bowser stated, “[a]s I got more into it, and especially as I got into FIAF, I became aware that if we were too selective films would die because there wasn’t somebody out there collecting them. So I began to feel it was my duty to collect everything I could get my hands on.” (Magliozzi and Bowser 2003)While part of any kind of archiving is to assess a collection and see what is “necessary” or “worth saving,” it is thanks to women like Eileen Bowser that we have certain films. If they did not firmly believe that all moving images were worthwhile, much would have been lost over those years. In addition to her thorough expertise on the collection, Bowser did extensive outreach with the academic communities and sought out rare at-risk films. Her work with the Brighton Conference exploded years later into further academic communities and her work pursuing silent film comedies grew into the area that film communities now know as “orphan films.” Bowser’s conception of film preservation and her job at MoMA clearly was one that traveled beyond the walls of her archive and extended to kinds of communal engagement. Her regular participation as part of the Executive Committee of FIAF and publications in film journals like the Journal of Film Preservation demonstrates this fact. Bowser stated at one point, “I’ve always said, the more people doing preservation, the better, because the job is so big. No one institution could possibly do it all.” (Magliozzi and Bowser) Her efforts and energies towards a larger film community instead of individuated archives may be one of her largest contributions of all. As time moved on and the film preservation world moved forward, it did indeed start to form a community. What was uniquely fascinating about this was that the gender dynamics and possibilities within the archival world are not on an equal basis with the rest of the outside world. In many ways, moving image archiving has been a place where women have been afforded the opportunity to excel and pursue goals that they perhaps would not have been able to do in any other field. While some of the same gender biases have indeed remained, one of the most defining features of the moving image archiving community has been that if you have the passion, the drive, and the know-how, no one will deny you employment due to your gender. It is distinctly possible that this aspect is due to the fact that our specialized knowledge means that we need each other and cannot afford to exclude someone based upon their gender. We are a fairly small community. However, as our history has proven, starting from the very beginning, women have taken leadership roles very seriously and had a strong desire to engage with film and its preservation. One of the more significant areas in which we can see women’s stalwart ties to the moving image archive community is within regional and specialized archives. While the film preservation world is overflowing with an assortment of very familiar organizations, such as the Library of Congress, Museum of Modern Art or UCLA Film and Television Archive, there are a wide variety of archives out there that are staffed and headed by women and have been for years. While smaller in stature, many of these archives have established themselves as major cultural beacons on a variety of levels. Northeast Historic Film was founded in 1986 by Karan Sheldon and her husband David Weiss. Located in Maine, this non-profit locally-based archive began with 31 titles and now boasts over ten million feet of film and a theater that they bought with the help of friends and constituents. This archive not only preserves films but maintains the theater as a regular space for various community activities such as screenings, festivals and local workshops. The archive is one of intense importance as it celebrates and rescues regional/local moving image information from the northeastern area that might otherwise be forever lost. Regional archives, while having it tougher on some levels, maintain a high level of cultural importance. What Karan and David have done in just a few years with very little funds is not only remarkable but also inspirational, as it shows what a love and passion for preservation can do. Karan’s motto according to her blog is to “find forgotten films and let them speak for themselves.” (Sheldon 2007) In the process of doing this, Sheldon has accomplished far more than the average person. Not only was she the co-founder of this successful archive, but she has also published nine different articles on the field of moving image archiving itself, served as the managing editor of Moving Image Review, and led over twelve different workshops at different conferences on a variety of subjects. Karan is well-versed in matters of cataloging and PBcore, but has also organized a small gauge symposium and has curated a variety of different film programs. When it comes to Jill-of-All-Trades, Sheldon’s got that one covered. While she may be attempting to let the forgotten films speak for themselves, she is doing what every moving image archivist tries their best to do: give that film a voice through which to operate, whether it be in the cataloging sector (organization), curation (visual), writing/editing (academic), or at Northeast Historic Film (preservation). Another film archive in which there has been an incredibly powerful female force has been the Pacific Film Archive in Berkeley. Started in 1966 by Sheldon Renan, this archive is universally considered to be one of the best for experimental film and international cinema. Their screening schedule has always maintained a uniqueness and caliber that is far beyond the average archive and the film preservations that they have done are well-respected. As Lee Amazonas writes, “the PFA is recognized throughout the world of cinematheques and film institutes for its commitment to film preservation and collection development. Filmmakers, scholars, and enthusiasts nationwide have the PFA library information line on speed dial.” (Amazonas 2004)While the archive may have been founded and developed by men, the “man behind the mask” so to speak has been the cadre of women at the helm. PFA’s first curator was Tom Luddy, but after a short term by Lynda Miles, Edith Kramer took over that position. As archivist Linda Tadic puts it, “Edith Kramer was curator at Pacific Film Archive for several decades. Under Edith’s leadership, PFA developed cutting-edge programming and built its archive into a major repository for Pacific Rim (Japan and China) and Soviet films; there is no equivalent collection anywhere.” (Tadic 2011) Linda is not the only one to feel this way about Kramer. Her work with the PFA is thought to be one of the deciding factors of why the Archive has remained so continually successful and relevant over the years. Kramer’s passion for film, her ingenuity, and dedication were what the Pacific Film Archive was all about. From the very beginnings, the PFA was always devoted to the unconventional cinematic, but Edith took that and created a real archival space as well as an exhibition and programming locale. As a smaller archive, the PFA has always had a much smaller budget. During the first few years, they were primarily dealing in donations and were mostly unable to make any purchases due to the lack of funds. However, that didn’t stop them. They were collecting and enthusiastically creating an archive. Then, in 1975, they received a $20,000 grant from the National Endowment for the Arts aimed at helping them gather together works of California Independent filmmakers. Incidentally, 1975 was also the year that Edith Kramer joined the PFA, and she was given the responsibility of building the intended collection. Edith Kramer was not the only powerful woman at PFA. If you look at the staff for the Pacific Film Archive, then, as now, there are many women in charge. In fact, most of the names haven’t changed! Mona Nagai is the film collection curator. Nancy Goldman is the head of the PFA Library and Study Center. Susan Wester is the film cataloger. Susan Oxtoby is the senior film curator and Kathy Geritz is a film curator. There are quite a few more female names on the staff roster of the Pacific Film Archive than there are men. So is this a feminist archive? PFA could be argued as such in the sense that it supports women in positions of power and platforms their successes and talents. Additionally, as an archive, they do possess a significant amount of feminist moving image content, lending itself more to a feminist identity. On the whole, however, the PFA has the same basic principles as every other moving image archive in the world: preserve, restore, archive and provide access. These principles themselves have no politic. Women have also taken big strides within the larger context of the moving image archiving world: leadership. Starting with FIAF involvement in the early part of the archival movement, female archivists have always found a way to involve themselves in roles of authority and power. Strong participation within larger community groups is critical to our field. It’s a way of making certain that your voice gets heard, no matter what kind of archive you work in, private or public. In addition, it’s the best way to further the field as a whole. Eileen Bowser said of her time with FIAF that “meeting with other archives gave me a real sense of archiving as a profession.” (Magliozzi and Bowser 2003) In doing so, and becoming a strong leader within the community, Bowser was able to do more for her archive and many women have followed suit. Women see leadership within the community as not only a chance to connect with each other and grow tighter as a community but also to learn more about film preservation and use that in a productive manner. The Association of Moving Image Archivists has been a place where many women have been able to find positions of influence. In 1990, two groups that had formerly been known as FAAC (Film Archivists Advisory Committee) and TAAC (Television Archivists Advisory Committee), or F/TAAC, combined to join one single group known as AMIA (Association of Moving Image Archivists). While F/TAAC had been meeting for over 15 years, this new group was a decidedly more open situation. They attempted to create a space where more moving image archivists and people interested in the field in general were welcome, not just the “professional types.” (Slide 1992) The first board included Karan Sheldon from Northeast Historic Film as treasurer, and while it started small, it grew quickly. While the first four presidents of AMIA were men, women were soon voted in. Indeed, statistically, the amount of women-to-men presidents of the board is exactly even, counting the current president, Caroline Frick. There are very few business organizations in the world that can be said about. While being in a role of authority was significant and rewarding, it wasn’t always the easiest of jobs. Linda Tadic served as AMIA’s first 2-year president from 1997-1999 and stated that during her presidency she had to “fight quite hard with very strong male members of the Board to develop the first AMIA Strategic Plan. The male members had been involved in AMIA since the beginning (and going back to F/TAAC) and did not think the organization required planning for the future; they had been running things just fine…” (Tadic 2011) Regardless of this hurdle, Tadic was able to soldier through and accomplish major goals, leading the organization to a place that broke away from those previously held tenets and start real progressive management for upcoming times. After Tadic, there has been Janice Simpson (2005-2009), Wendy Shay (2009-2011) and the current president, Caroline Frick. Not counting the current president, in the 20 years that AMIA has been an organization, 11 of those years have had women as president. One could easily say that female moving image archivists have had a huge influence over the organizational tactics of the field. Starting from the beginning with Iris Barry, it has been clear that if there were things to be done, it wasn’t simply a matter of discussing them with those you worked with; it was a matter of becoming a part of the larger establishment. Within other institutions and fields, this is not always an option for women or if it is, many women feel intimidated when it comes to making the leap towards power. Due to the high volume of representation, moving image archiving is one of the few fields where women may not feel threatened and will charge forward and pursue positions of power. While there may still be obstructions and they may indeed be gender-associated, it should be of some consolation that due to our own power within the group, we can likely massage these issues out with some work. Many women have become part of the entertainment industry, which has given them an entirely different sense of power and new comprehension of the moving image archiving world. In some ways, this world is much less sensitive to women as it was borne directly from an industry that is still very much patriarchically dominated. While there are influential women in this arena, they have very different lives and are likely treated quite differently than they would be if they were working at a regional archive. In addition, due to the way that these industries are configured, many times they must formulate entirely new ways of working from within these systems. While not always the case, certain interviewees told me that sometimes having to eke out an individual position and be the singular female on the floor made a big difference in the way that a company was run or how their career ran. In certain situations, being the lone female expert at a company shattered what might have built a glass ceiling on their profession. Regardless of where these women archive, there are incredibly powerful and dynamic things being accomplished. Working in the private sector can be attractive to some but also quite difficult, especially as a woman, due to the numerous challenges it presents. However, if it is a milieu where you thrive, it is one that can be rewarding, beneficial, and ultimately quite essential to the field. Andrea Kalas, former president of AMIA, is one of the most powerful women in this area. Currently holding the position as the Vice President of Archives at Paramount Pictures, she has also worked at the British Film Institute, DreamWorks and the UCLA Film and Television Archive. A regular panelist at conferences such as the Reel Thing and the AMIA Annual Conference, her focus as of late has been on things such as digital asset management (DAM) and digital preservation. Her presentations have ranged from discussing digitizing Paramount’s deep catalog to the most incredible and glorious recent restoration of the silent film Wings (1924) for Blu-ray and DVD. Kalas’ tremendous skill as a technician in addition to her immense knowledge and respect for film history make her one of the foremost authorities in this area. Indeed, it is Kalas’ agility and creativity within the technological realm that has made her so well-known but it is her capacity to take that and bridge the “then” with the “now” of film preservation that makes her work so truly special and critical to our field. The experience and career that she has built amongst some of the biggest names in the world also exhibits how strong her archival initiative is. This passion for preservation shows in everything she does. Each panel that she presents and every interview she gives demonstrate remarkable enthusiasm and love for the work. Kalas brings a strength and professionalism to her job that only someone who is truly engaged with and committed to her work could. It is a kind of archival devotion that Eileen Bowser used to vocalize and the kind of dedication to the field that has been revealed by many a different archivist over the years: it is a love for film and an overwhelming desire to see it continue, regardless of what age we’re in or format it happens to exist on. Within a different part of the entertainment world, there are women in the field of broadcasting like the ones at the Boston station, WGBH, Mary Ide and Karen Cariani. Broadcasting work is significantly different from that of a studio, however it is still moving image archiving and the intentions are similar. In addition, while WGBH may be part of the public sector technically, the fact that it works toward the entertainment of the public means that it has a very analogous intention to many of the more corporate bodies of the field. While Mary Ide is no longer at WGBH, like Andrea, she has been a crucial figure within the field of digital preservation. Not only has Mary helped to prepare and work on projects that would help in the preservation of digital public television (Ide and Weisse 2006), but she has also been vital in the efforts to create a Universal Preservation Format. (Ide, UPF Home 1997) Without Mary Ide, there is a genuine possibility that public television would not have as many options for digital preservation practices as it does today. Seeing as public broadcasting is already an underfunded realm, her work is key, especially considering the kind of programming that generally is shown on stations like WGBH. Her successor, Karen Cariani, has taken up the mantle of this project. As archivist Linda Tadic has said, “Karen is so active- she furthered Mary’s goals and went beyond, developing WGBH’s DAM, incorporating open source tools into public and scholarly-facing resources as no other archive has done in the United States, helping to develop PBCore, and being active in the national standards-bodies scene.” (Tadic 2011) It is quite obvious that WGBH has not only had powerful females working there but endorsed them. In response, these women have not only indelibly changed the face of the moving image archiving world but advanced it. Upon being interviewed about their experiences within the field of moving image archiving, the one thing that most women had something negative to comment on was the issue of technology. Apparently, even today, no matter how many women handle digital restoration and preservation, digital asset management (DAM), or any variety of modern metadata software, there is still a sense that “it’s a machine. Women don’t understand machines.” While it may be true that there are fewer women in the technological areas than there are men, this is changing. Liz Coffey is an archivist at Harvard Film Archive whose background in technology led her to her current career in preservation. She states, “I was a projectionist for a long time, and I learned a lot about film equipment. This technical expertise isn’t generally encouraged among women. I am under the impression that women face similar issues with digital media.” (Coffey 2011) While Liz was lucky enough to have been trained with that equipment and to obtain that knowledge, sometimes it is still difficult to get, no matter how much it is desired. To an extent it is something that must be grabbed and taken by force or at least within a proactive manner. It is one of the major areas where the moving image archiving field is still in the Dark Ages. However, as behind as it is, it’s nothing compared to what it used to be. It is true that issues of sexism do arise and they are primarily associated with the topic of the technological. One archivist discussed an experience she had that she felt she could have actually filed legal papers due to gender bias. It surprised her, as she truly thought that these things had dissipated with time and that “things would improve as people are forced to attend numerous HR-sponsored sensitivity training workshops and women have become more active in technical fields. The experiences were in IT departments or IT-related occupations. In both situations, the male supervisor was in turn supervised by men or surrounded by male peers who would support him. I am hopeful that as more women enter administrative level positions in technology these kinds of experiences will lessen for other women in the field.” (“Betsy” 2011). As one archivist says, “In the old days, many of the male archivists dismissed the knowledge of the women. There was a bit of “girls don’t and shouldn’t know technical stuff,” similar to women bringing a car to a mechanic. I think we were somewhat marginalized. Cataloging was approved “girls work.” Talking to lab folks- not so much.” (“Nina” 2011) This kind of gender bias that the interviewee brings up is not so much indicative of the moving image archiving field as it is a larger societal paradigm. It is actually a case wherein a larger rhetoric comes into play, and technological ability becomes gendered. As the participant above mentions, it was a marginalization due to technological ability, but not necessarily due to archival skill itself. What becomes expressed here is striking in that it is the access point where the outer world of codified gender roles has a real impact on moving image archivists. It is here that we see indisputable gender-related issues arise and it is not due to anything endemic to our field, but due to something that has bled in from the “outside world.” What does make it unusual is that in almost every other area in the moving image archiving world, women are, more or less, regarded as equal. This may be partially due to the fact that there are a substantial number of women who have made names for themselves and been recognized for their abilities, but, once again, it may also be due to the fact that we are a small, insular group that relies on the concepts of community. However, as time moves forward, there is hope. One archivist notes that “we have some very smart women fully engaged with the issues and knowledge required to lead in the digital world.” (“Nina” 2011) And as Linda Tadic says, the landscape does seem to be changing a bit. She states that women are becoming much more involved now in the digital/technical world on a regular basis. Eileen Bowser stated in her interview with Ron Magliozzi that she had been attempting to get MoMA to collect equipment because “technology changes.” (Magliozzi and Bowser 2003) She was aware of the technological relationship to the moving image and preservation way back when. Women have been keeping up on this and trying to be part of it from the very beginning. When it comes to gender bias, this is one of the major sources of quandary within the community, and it is a big one. It’s something that should truly be worked out. Women who preserve film have formed a very strong community and have tended to form quite powerful relationships within the group. One archivist states, “I have gotten to have a few close “girlfriends”…I rely on them for advice, contacts…” (“Irene” 2011) Liz Coffey believes that women in moving image archiving should really stick together. “There are a lot of us in the field, and feminism is a powerful tool. Communication, mentoring and just thinking about our place in the world is important.” (Coffey 2011) There is an entire population of female archivists who have been working rigorously towards the preservation of the moving image without necessitating recognition. It’s time to break that habit. As women in this field, we need to start to “think about our place in the world” as Coffey says, and what we would like our presence to be in this new digital archiving age. We have always been here and we have always been a community, relying on each other and serving in positions of power; jockeying for technological employment against all odds, and developing new methods of preserving our moving images. Let us move that one step forward now and begin to actively construct a database or historical repository to represent all the absent voices and perhaps begins to massage out those problematics of gender and technology. It can be done. “Betsy”, interview by Ariel Schudson. Women in Archiving: Personal Interview (December 5, 2011). “Irene”, interview by Ariel Schudson. Women in Archiving: Personal Interview (December 7, 2011). “Nicole”, interview by Ariel Schudson. Women in Archiving: Personal Interview (December 2, 2011). “Nina”, interview by Ariel Schudson. Women in Archiving: Personal Interview (December 5, 2011). Abbott, John E., Iris Barry, and Alfred Barr Jr. “An Outline of a Project for Founding the Film Library of the Museum of Modern Art.” Film History, 1995: 325-335. Amazonas, Lee. 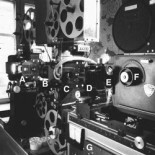 “GUERRILLA CINEMATHEQUE COMES OF AGE: The Pacific Film Archive.” Chronicle of the University of California: A Journal of University History, 2004: 147-159. Bowser, Eileen. “Symposium on the Methodology of Film History.” Cinema Journal, 1974-1975: 1-2. Coffey, Elizabeth, interview by Ariel Schudson. Women in Archiving: Personal Interview (December 5, 2011). Collu, Ranato. “The American Avant-Garde Film Collection at the Pacific Film Archive.” Journal of Film Preservation, 2010. Goldman, Nancy, interview by Ariel Schudson. Women In Archiving: Personal Interview (12 5, 2011). Gracy, Karen F. Film Preservation: Competing Definitions of Value, Use and Practice. Chicago: Society of American Archivists, 2007. Horak, Jan-Christopher. “Surveying AMIA’s First Twenty Years.” Moving Image, The, 2011: 113-127. Ide, Mary. UPF Home. August 25, 1997. http://info.wgbh.org/upf (accessed December 2011, 7). Ide, Mary, and Leah Weisse. “PRESERVING DIGITAL PUBLIC TELEVISION: RECOMMENDED APPRAISAL GUIDELINES FOR SELECTING BORN-DIGITAL MASTER PROGRAMS FOR PRESERVATION AND DEPOSIT WITH THE LIBRARY OF CONGRESS.” Appraisal Guidelines, Boston, 2006. Magliozzi, Ronald S, and Eileen Bowser. “Film Archiving as a Profession: An Interview with Eileen Bowser.” Moving Image, The, 2003: 132-146. Museum of Modern Art, The. “HAND-PICKED FILMS CHARACTERIZE MUSEUM’S WEEKLY SHOWINGS. Press Release.” http://www.moma.org. 1968. http://www.moma.org/docs/press_archives/4080/releases/MOMA_1968_July-December_0013_64a.pdf?2010, 1968. (accessed 12 12, 2011). Sheldon, Karan. karansheldon.blogspot.com. January 1, 2007. http://karansheldon.blogspot.com (accessed 12 10, 2011). Slide, Anthony. Nitrate Won’t Wait: A History of Film Preservation in the United States. Jefferson: McFarland & Company, Inc., 1992. Tadic, Linda, interview by Ariel Schudson. Women in Archiving: Personal Interview (December 2, 2011). Please note that all names in quotations are from interviews taken with participants who preferred that their actual names not be used for the sake of this study. This entry was posted on June 3, 2013 by sinaphile in Access, Film Exhibition, Gender Concerns and tagged AMIA, Andrea Kalas, caroline frick, edith kramer, eileen bowser, Elizabeth Coffey, female film archivists, FIAF, iris barry, Karan Sheldon, linda tadic, margareta Akermark, nancy goldman, pacific film archive, women in moving image archiving.